Lose the weight you want with a solid running plan. 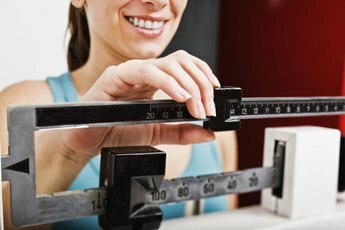 Two months is about nine weeks, so losing 18 pounds in two months means a loss of two pounds per week -- a healthy, attainable goal. You need to burn approximately 7,000 calories to lose two pounds of fat; a combination of diet and exercise is essential for your success, and running is an excellent exercise for fat burning. It’s helpful if you actually enjoy running as it will drive you to keep on plan. Enlist a partner to join you and keep you motivated. Figure out how many calories you consume per day. Keep a food journal, as people are often surprised by what they actually eat and drink when they see it written down. By recording your diet, you won’t forget about that handful of nuts you downed before dinner or the muffin you had with your coffee. If you’ve been maintaining your weight at your current activity and caloric level, adjust your diet to consume 3,500 fewer calories per week. If the weight has been creeping up, you may have to reduce your calorie consumption even more. Use an online calorie calculator to figure out how many calories per day you should be consuming to maintain your weight, and then reduce that number by 500. Your muscles won't function as well on a fatty diet, so try to keep your fat consumption under 25 percent. Ensure your diet is balanced to provide you with the energy for your running program. Plan your run. A 150-pound person will burn approximately 100 calories every ten minutes at a speed of 5 mph, a comfortable pace. 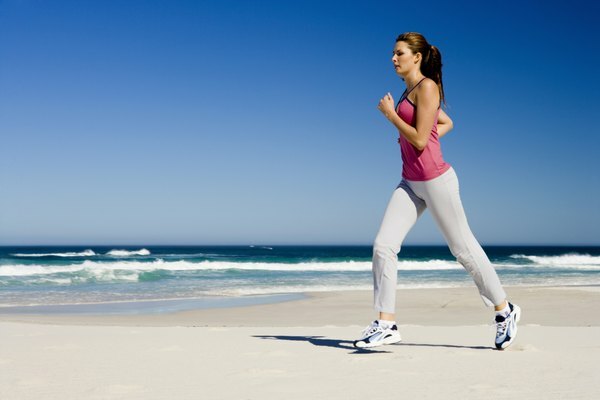 To burn 500 calories that day, you’ll need to run at 5 mph for about 50 minutes – that’s just over four miles. So get in your car, set the trip odometer to zero and measure a route that’s four miles. If that same 150-pound person runs at 6.7 mph, it would take 37 minutes of running to burn 500 calories. If you’d prefer to run five days a week, you’d need to run for 70 minutes at 5 mph or 52 minutes at 6.7 mph. Since it’s hard to know just how fast you’re running, set your route based on the speed and time you’d like to run and let a comfortable pace be your guide. Time your run to figure out your speed, then calculate the number of calories burned based on your distance and time. Adjust your route as necessary. Or, just enjoy your run, push yourself and feel good about your accomplishment. Hop on a treadmill. And remember technique counts -- if you hold on to the side handles, you’ll burn fewer calories than with your arms swinging at your sides. Set the speed at a comfortable pace, increasing and decreasing the elevation as you run. 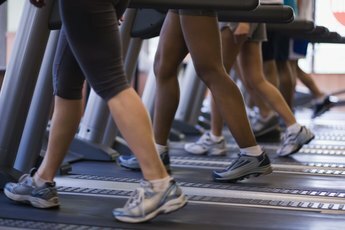 Treadmills are easier than running outside in terms of counting calories because it does it for you. If you want to, get off sooner, run faster and/or increase the elevation. Some people like to run fast for a few minutes – say 8 mph – and follow that by a few minutes at a slower speed – say 4.5 mph. Slow and steady is an easy way keep up the pace, but won’t burn the calories as quickly. Weigh yourself once a week. 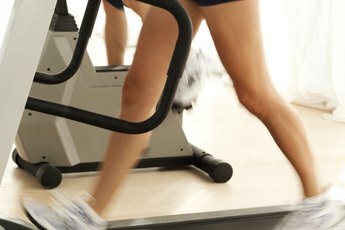 Keep in mind calorie counters on treadmills aren’t necessarily accurate, nor are the numbers quoted for running since they don’t take into account muscle mass, metabolism or form. Take the numbers with a grain of salt. Adjust your running program to ensure you’re losing those 2 pounds every week. If you fall behind, increase your exercise the following week to catch up. And don’t forget strength training, which the CDC recommends doing twice a week, focusing on all major muscle groups. The more lean muscle you have, the more calories you burn since lean tissue is more metabolically active. As your muscles become more efficient at running, you’ll burn fewer calories, so expect the weight to come off more quickly at the beginning of your program. Cross-training is one way to prevent that dip in calorie-burning due to muscle efficiency. Columbia Health: Go Ask Alice! : Are Exercise Equipment Calculations Reliable? 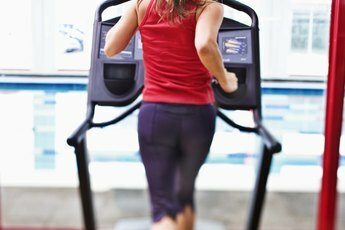 Which Workout Makes You Lose the Most Calories?